Jeffrey Welch's Blog: Imodium for Dogs — Is It Okay to Give Your Dog OTC Human Medicine for His Upset Stomach? Does your dog have an upset stomach? Whether the primary symptoms are erupting from one end (vomiting) or the other (diarrhea), when our canine friends take ill, no matter how light or temporary the situation may be, we instinctively turn to those over-the-counter products that bring us the most immediate relief. So, let’s talk Imodium for dogs — can you give a dog Imodium? Is it safe to give a dog Imodium? Can you give a dog Pepto-Bismol or Kaopectate for his upset stomach? Imodium for dogs — is it safe for your pup? Photography ©stonena7 | Thinkstock. Before you consult with the family pharmacopoeia, or dash to the medicine cabinet in search of a solution, take a moment to consider the context of your dog’s upset tummy. Have you recently changed your dog’s diet or brand of food? Has baby been rooting around in the garbage or eaten something he should not have? Has your dog traveled recently, been in a kennel or boarding facility, or been subjected to any unusual stressors? Figuring out the cause of dog diarrhea can be easier if you pay regular attention to the quality of your dog’s stool. You should also take severity and duration into account before giving human medications of any kind to dogs. Diet and stress are the two most common causes of dog diarrhea, and, even untreated, these conditions usually resolve themselves within a couple of days. Let’s look at three of the most popular over-the-counter upset-stomach treatments for humans and assess the risks and potential benefits that they offer to dogs. Right off the bat, though, I’ll remind you that most cases of upset stomach, vomiting or diarrhea in dogs resolve themselves within a few days of symptom onset. Further, a general rule of thumb for human medications is to keep them away from dogs. That said, let’s start with Imodium for dogs, since the two others we’ll look at, Kaopectate and Pepto-Bismol, both contain the same active ingredient. What does Imodium do? Imodium is a brand name for a non-addictive drug called Loperamide, which slows the movement of material through the digestive tract, and encourages the absorption of excess water. These properties imply that in cases of diarrhea in dogs, Imodium for dogs should act to prevent frequent, watery defecation and limit the repetitive, fruitless, and unproductive straining that accompanies loose stool. Like most OTC medications these days, Imodium is available in liquid and pill/chewable tablet formats, as well as in varieties that contain different ingredients. The list of restrictions on Imodium for dogs reads like one of those commercials you see on television, where the warnings take fully a third of the air time to disclose. The most important of these include cautions against use in senior dogs, and against treatment of diarrhea caused by toxins or bacterial infections. It really is best to at least call a veterinarian before you give your canid friends human medications of any kind. In its current formula (since around 2003), your standard dose of Kaopectate is practically the same thing as Pepto-Bismol. Both have a common active ingredient, to wit, bismuth subsalicylate. Though no one is completely sure how bismuth subsalicylate works, we do know that it continues to be used to treat upset stomach, diarrhea, vomiting and nausea. Medicines like Kaopectate and Pepto-Bismol coat and reduce inflammation along irritated digestive tracts, as well as functioning as acid reducers. However, as with Imodium, Kaopectate and Pepto-Bismol also come in a variety of formulas, each with its own strength, and each geared toward resolving a specific digestive issue. In other words, not all over-the-counter upset stomach medications are created equal, and the one you trust when your stomach is unsettled may do more harm than good when administered to a dog. Even a basic, standard formula can interact poorly if your dog is on other prescription medications, and frequently leads to blackened stools or constipation in dogs. I’m certain there are many readers who have successfully mitigated upset stomach symptoms in dogs with the help of human over-the-counter medications like Imodium, Kaopectate and Pepto-Bismol. Before you try it yourself at home, place a call to your dog’s vet, particularly if symptoms have persisted for more than a couple of days. The size and weight of your dog should always be taken into account for dosage limits and how long and frequently it should be given to a dog. On the other hand, you could try out tried and true non-narcotic solutions. Diarrhea, in particular, is one of the most common reasons that vets hear from dog owners. My own dog’s vet recently echoed conventional wisdom for dealing with digestive issues in dogs. She recommended that I try simple, unadorned, cooked white rice along with small, easily digestible bits of boiled chicken breast for a couple of days at mealtime before transitioning my dog back to her normal kibble. 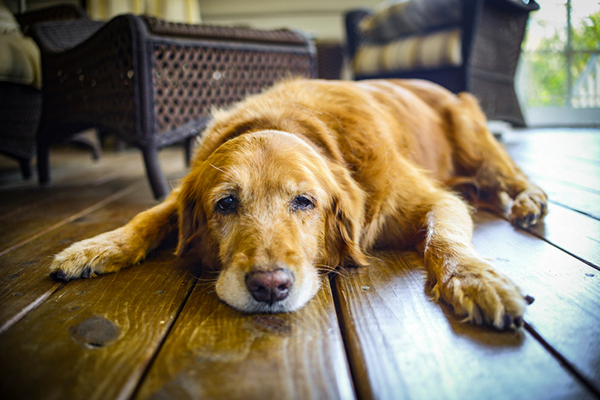 How do you treat upset stomach in dogs? Wholesome, short-term treatments, like chicken and rice, thankfully have no dangerous side effects and can help get a dog’s gastrointestinal tract back on track. If you take the time to search the internet in quest of a solution to a dog’s upset stomach, then you are clearly thorough enough to understand and appreciate the risks of giving human over-the-counter medications to your dog. Remember that most cases of diarrhea and vomiting in dogs have dietary or stress-related causes, and most resolve on their own with no treatment. If your dog is ill at ease for more than a couple of days due to vomiting or diarrhea, dehydration becomes a concern, and you should consult a veterinary professional. How do you deal with upset stomach issues when they arise in your puppy pals? Let us know in the comments! Thumbnail: Photography by Igor Normann/Shutterstock. The post Imodium for Dogs — Is It Okay to Give Your Dog OTC Human Medicine for His Upset Stomach? appeared first on Dogster.